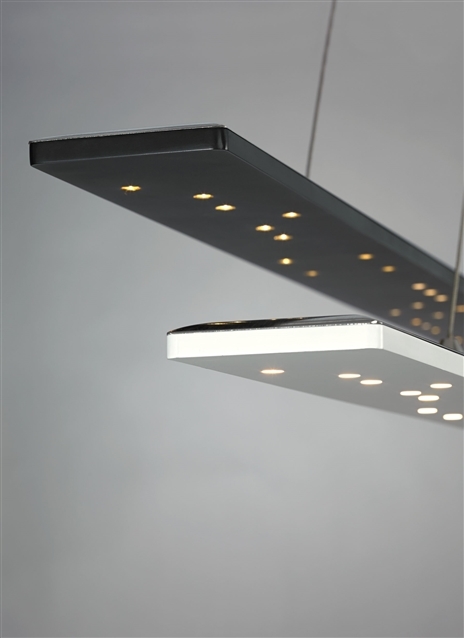 The Parallax linear suspension piece is equal parts minimalist and futuristic. The ultra-thin aluminum and acrylic body houses thirty high-powered LEDs which contributes to its simplistic beauty yet also make it incredibly functional. With its scale of 54” and sleek design style the Parallax is ideal for both residential and commercial lighting applications. This highly modern suspension piece is available in two modern acrylic finishes, Black and White and ships with your choice of integrated LED lamping saving you time and money, both LED lamping options are fully dimmable to create the desired ambiance in any space saving you both time and money. The ultra-thin aluminum and acrylic body houses 30 high-powered LEDs which contribute to its simplistic beauty but also make it incredibly functional in both residential and commercial applications. Includes 40 watt, 2770 delivered lumen, 3000K LED. Both finish options ship with Satin Nickel canopy and 12 feet of field cuttable cable. Dimmable with low-voltage electronic dimmer.